Decorative paints may be used as unexpected solutions to customise in an original and interesting way any type of outdoor space. 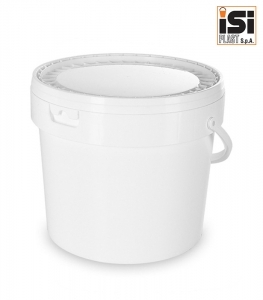 ISI Plast offers then MU15000 as container for decorative paint, ideal to contain up to 12,5 lt of product. Thanks to its technical characteristics it is able to guarantee a perfect seal of its content (pressure lid). Made in first choice and quality material (Polypropylene) MU15000 is characterized by the presence of the upper band on which is placed the tamper evident seal; the particular shape of this seal has been designed specifically to allow its removal in an easy and ergonomic way. With a brimful capacity of 16,1 lt, MU15000 is an easily moveable container thanks to the practical tilting handle available both in plastic and in metal. The conical design and the possibility to print the bucket through the application on IML-Labels make this packaging a extremely captivating solution to contain decorative paints and similar products.